The Shear Comfort Superior Overlay is not limited by the size of sheep. HiTemp UR Medical Sheepskin pelts are sewn together to create this total bed cover. This means that users are protected from the shoulders to the toes. Particularly suited for long term patients, where shear and friction are also a concern. Place the Superior Overlay on the bed, wool side up. It is best to lie directly on the wool for maximum benefit; 24/7. 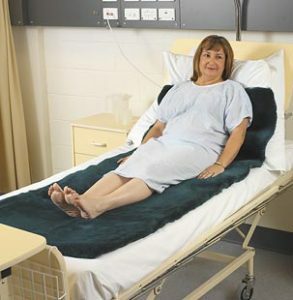 Shear Comfort Bed Overlays are made from premium grade HiTemp Urine Resistant Medical Sheepskins; making them suitable for use by incontinent clients. Shear Comfort Superior Overlays are machine washable( Warranted for up to 50 washes)- however, you should be aware that this large product becomes very heavy when they are placed in water- so hand washing can be difficult. This Shear Comfort product is machine washable in an approved Sheepskin Shampoo & Conditioner. 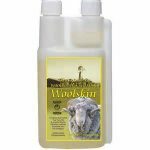 We recommend that you use Woolskin: Sheepskin Shampoo & Conditioner to clean and disinfect this Shear Comfort product. Woolskin contains the natural fungicide and miticide..Tea Tree Oil, together with wool and leather conditioning agents. Shear comfort products can be dried in the dryer using low heat and gentle agitation. Do not over-dry since wool performs best with 15% residual moisture. Best care would be to Air- Dry. Products will last longer if not exposed to heat.